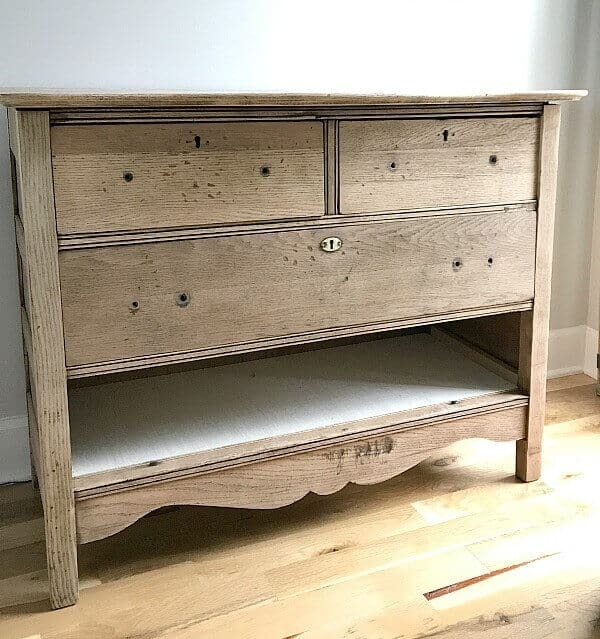 I took this ugly, disgusting dresser and transformed it into a beautiful DIY unfinished natural wood dresser and today I’m sharing all the fun details with you all! Undeniably, there’s a problem with being a DIYer. I can’t quite seem to reconcile my wallet with retail priced products. While visiting shops and thrift stores, I see maker pieces that draw me in. I gasp and swoon and oogle over that gorgeous piece. That is, until I look at the price tag. I sigh and walk away because it’s always too rich for my blood. 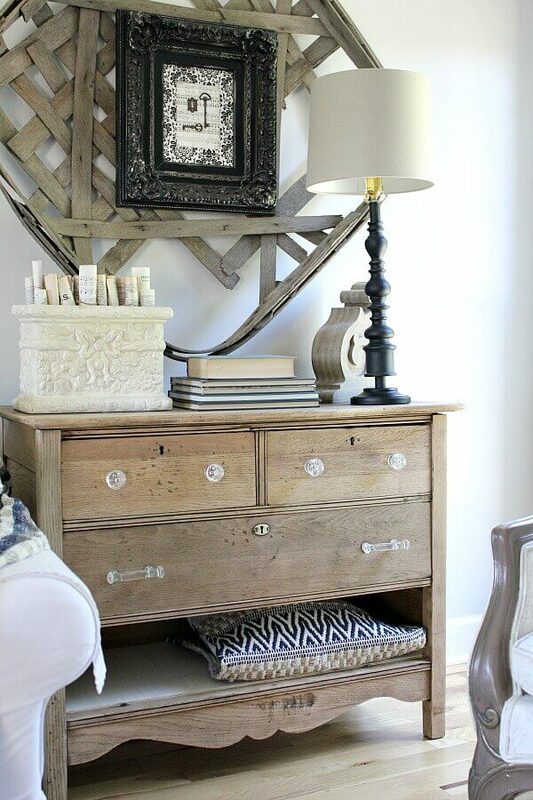 As a result, I’m always hunting in dives for cheap pieces I can love back to life, just like this chest, and boy does it have a story! So, there was this local junk shop that was closing it’s doors and it was a sad, sorry place. Windows busted out, random bowls of cat food laying around, and forgotten items that not many people would want. The truly sad part is that I believe the owner squatted there amid all that junk. I think I even walked out with a few flea bites. It was a kind man down on his luck just wanting to make a buck so he was basically giving his items away. That’s when I saw this dresser. And I saw the groups of people turning their nose up at this disgusting piece. 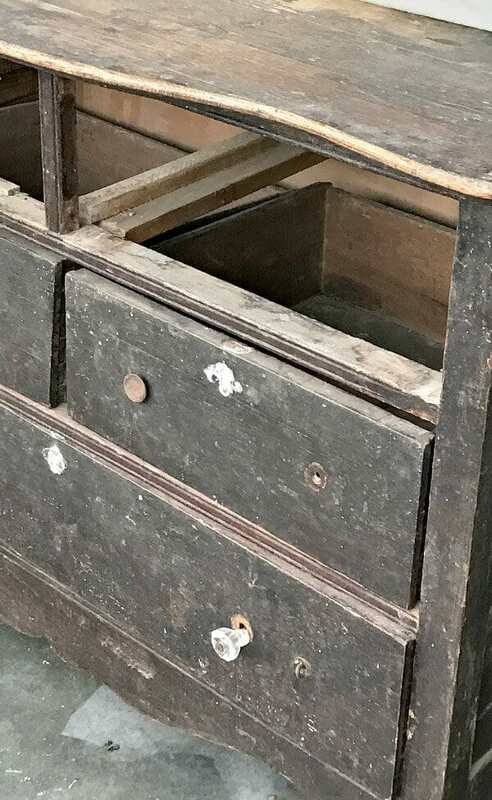 Covered in stains, it had a unique smell, was missing a drawer and the remaining drawers had a mysterious fuzz growing inside of them. Formerly a beauty, it was now a sad piece that needed love. 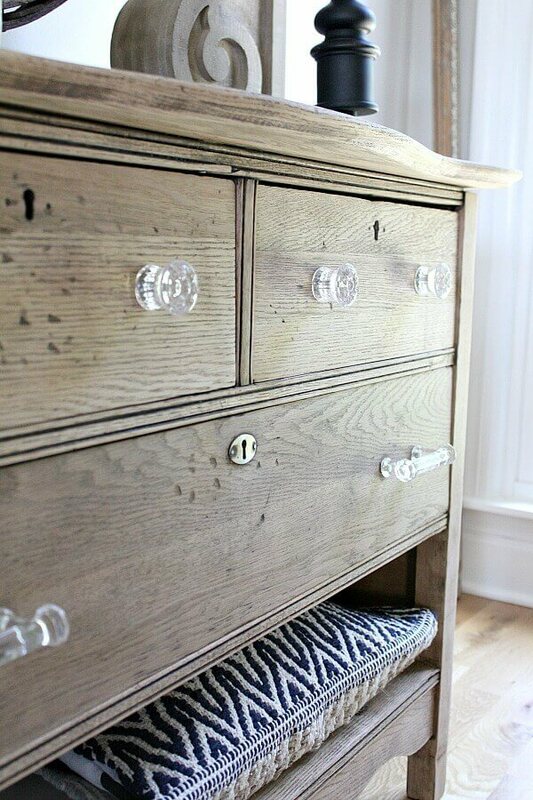 I adored the curves and lines of the dresser and knew I could give it grace and love it back to life. Here’s how I did it – I’ll provide affiliate links for your convenience. Read my full disclosure here. To begin, I started taking the drawers out. A total aside – I did not take pictures because of the dangerous state of this piece. Donning a hazmat suit, I tackled that piece with much caution. Chiefly concerned for my safety, I was worried that I’d carry any cooties from this piece to my phone or camera. That wasn’t about to happen, so no pics of the stripping process. The mystery fuzz really bothered me, so we removed all the bottoms from each drawer and took them to the dump. We, really meaning Trent, because it really, really gave me the all-overs. While he was heroically disposing of the ick, I started stripping the piece with a scraper and Citristrip stripping gel. 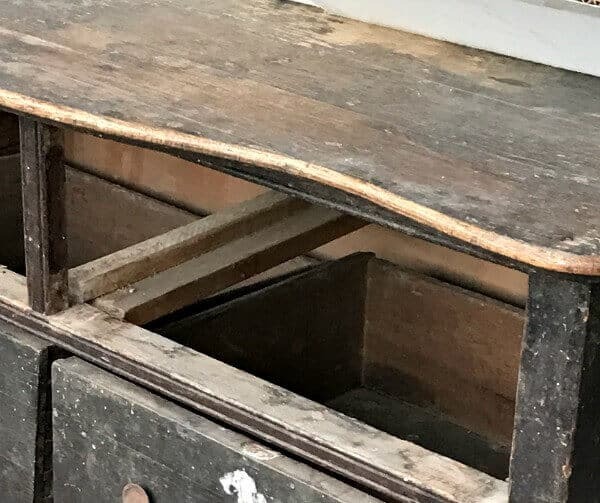 Stripping furniture can get really messy, so prepare a container to place the gunk in. An old cardboard box worked perfectly for this. Just apply the stripper, let it sit a bit, and scrape it off. After you strip the piece, wipe it down afterward. I used soapy water because I knew it would be sanded, but you can use vinegar as well. Using a sanding block, I started sanding the chest. Since this was in such poor shape, I also sanded the interior to make sure I removed any remaining yuck that was there before. Similarly, I sanded the interior and exterior of all the drawers, just to be safe. For the missing drawer, we cut a piece of thin plywood to act as a shelf for blankets or books. It was at this point that I fell in love with the natural look. The veining in the wood grain stole my heart! Using the same thin plywood, we inserted cut to size pieces into each drawer for the bottom. Now it was time for the jewelry!! The piece in it’s before state still had it’s glass drawer pulls, but they were all broken, so I couldn’t salvage them. I scored some gorgeous replicas at Hobby Lobby’s 50% off sale. 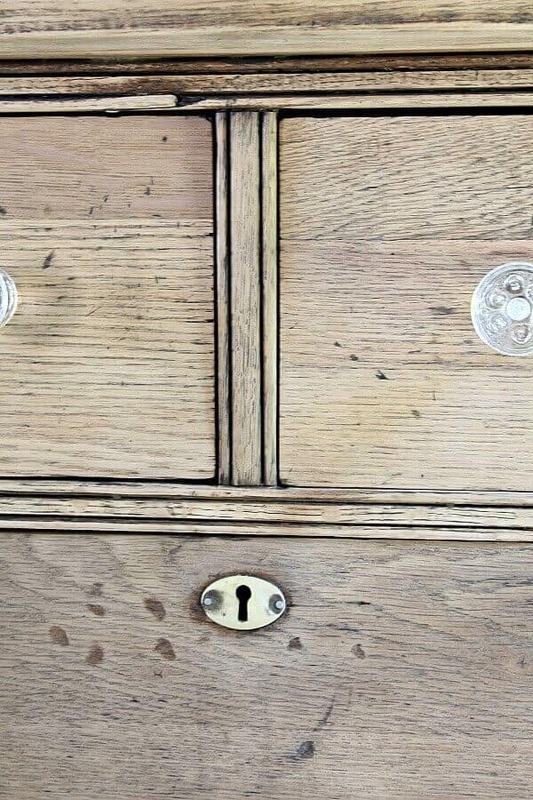 I love that one of the brass key holes remained in tact and hopefully I can find 2 more to match the top drawers. 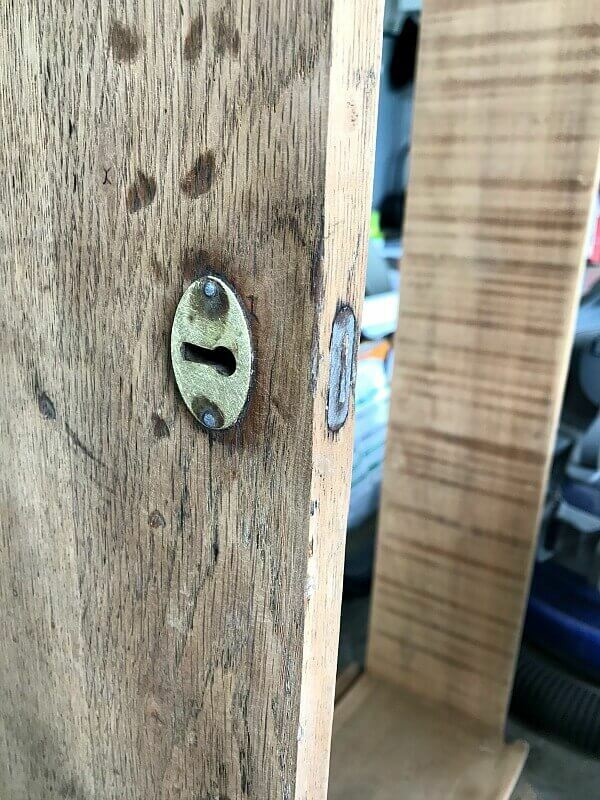 Obviously, it was difficult to remove all the previous stain from the grooves. However, that is my favorite element, adding that aged look! 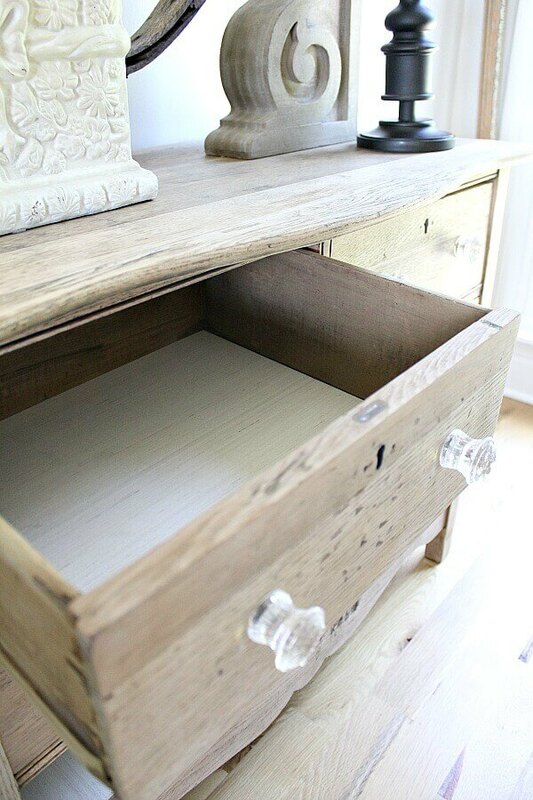 Finally, this DIY unfinished natural wood dresser is happily at home next to my sofa. I hung an old tobacco basket over the chest with a favorite DIY frame and artwork of mine. It’s a gold frame spray painted black and distressed to let peeks of that gold shine through. I framed my old Scrapbook paper photo mat with old sheet music and key elements. 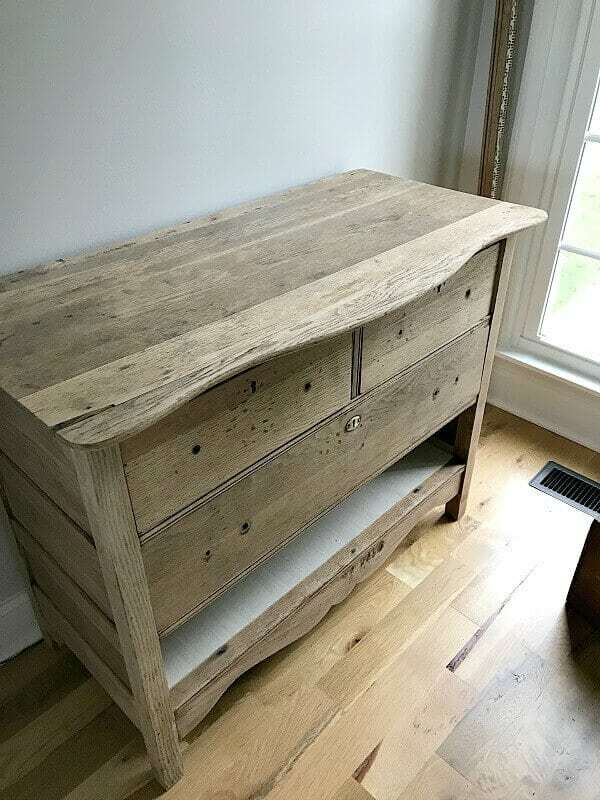 I’m so pleased with how my DIY unfinished natural wood dresser turn out! I can’t wait to hear your thoughts. Let me know if this inspires you to hunt down a piece to love back to life. 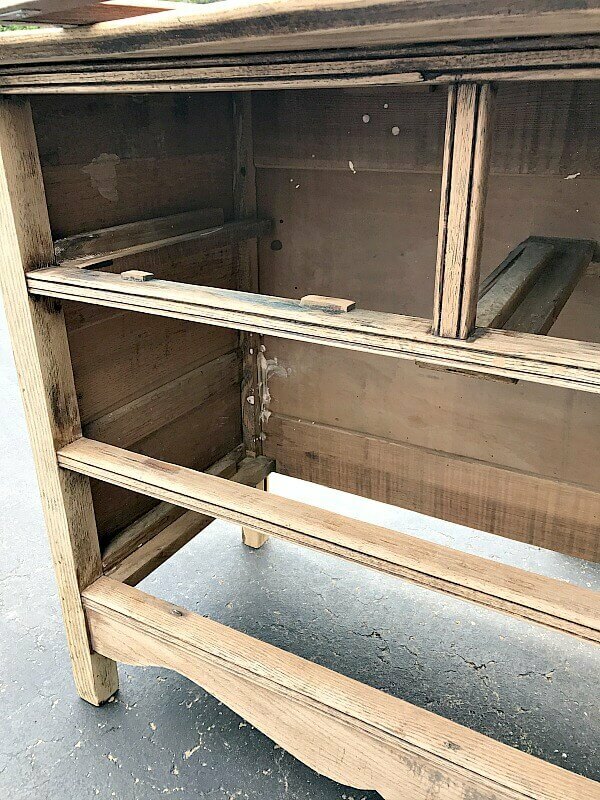 For tips on how to care for unfinished furniture, I found this article here to be very helpful. Ahhh, this is a gorgeous piece! I am so tempted to create a similar look for my husband’s grandparent’s oak dining table. Beautiful swirly, grain of oak I think it would be stunning. So I dare? I love the work you do. Thanks for the inspiration. It’s stunning! I’ve always wanted to do it with a couple pieces, but not sure if I have the patience. I love the unfinished look Jen! Great post. This is fabulous! You did this piece amazing, Jen! You do amazing work Jen. 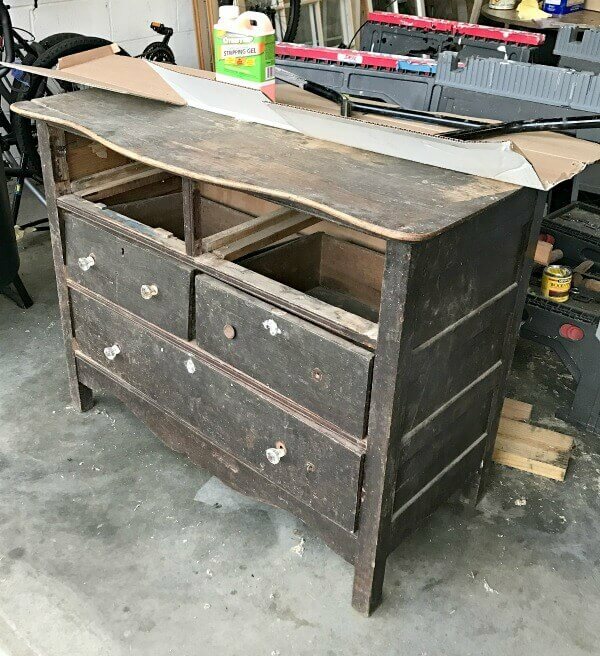 This old chest went from junk to treasure. Wouldn’t you love to know the history of this piece. I’m sure the person who made the chest or previously owned it would be pleased with all of your hard work and the final outcome. Good for you!! Gah! Its gorgeous! I love me a good piece of raw wood furniture! Jen I love this dresser. Love that you stripped it and revealed its true beauty! Now you can actually see all the details of that fine wood. I a normally a painter but I applaud you for having the guts to bare it all. I also host a link party every Friday and would love for you to join us. It is called Sweet Inspiration and is actually up right now. Pinned this beauty! Thanks so much for the invite! I just linked up and will add it to my regular list of parties! Thank you so much, Sara! Your words mean so much to me! Thanks Deb! It was a challenge, but I love the result! Thank you so much! It was a grimy piece, but I think I loved it back to life! Thank you so much for all the shares and sweet words! You are so kind to help this little chest get attention! 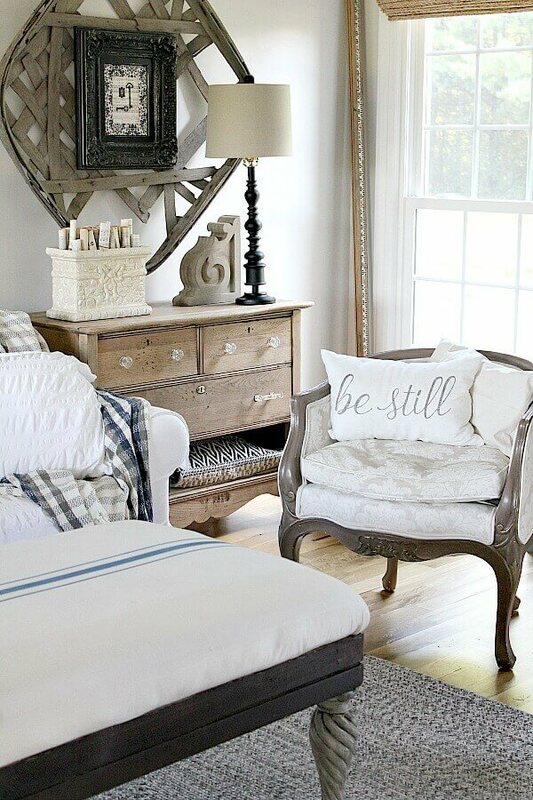 I love finding neglected pieces and bringing them back to life! This is one of my fav makeovers. It gives me the encouragement to keep doing it! Thanks for your sweet words and for taking the time to comment! OOH! That would be beautiful! If you do – be sure to send me pics! I’d love to see it! I’m Florence from Sweet Inspiration & I’m glad you came along & pinned your outstanding creation! I could see where it was going after you got all the gunk off and sanded. Isn’t it remarkable how a piece is transformed with stripping? I used to do quite a bit of stripping myself. I love the look of it now & leaving it natural was a plus I think…especially as it fits in so well with your other pieces. 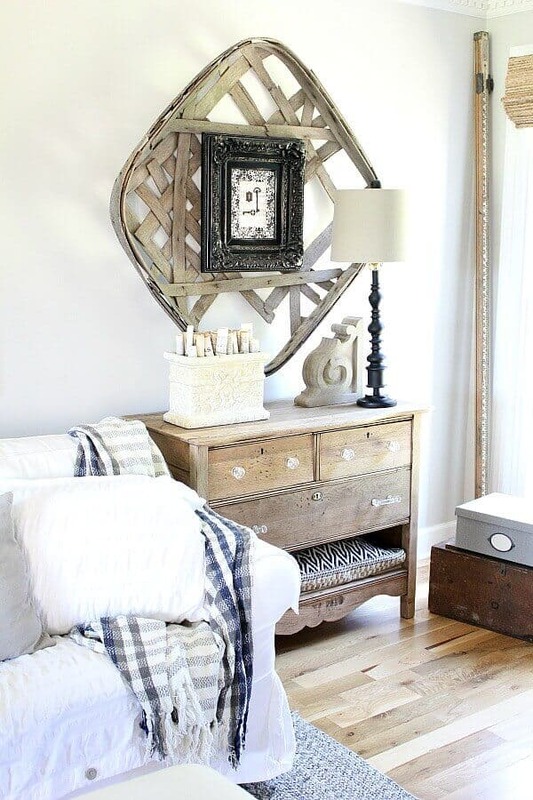 Love that tobacco basket on the wall too! What an amazing transformation! I am always impressed by those, like you that see the possibilities in sad little pieces and turn them into such wonderful additions for their homes. Lovely job with this piece! Thank you so much for sharing at Celebrate your Story! OMG I love this. 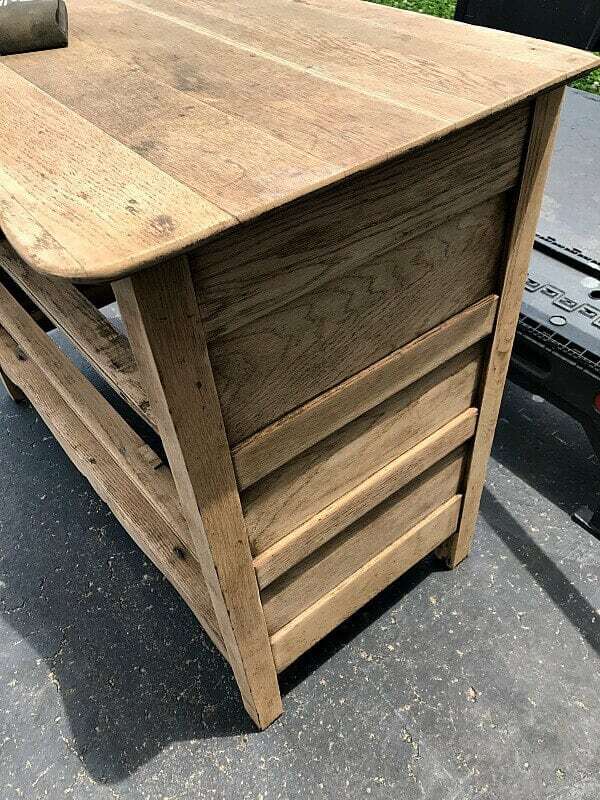 I have a coffee table that I want to strip and leave natural, but i was scared about how it might turn out. But now after seeing your project, I’m gonna try it! Jennifer, you did an amazing job with this and it’s a beautiful transformation. I hope and pray that the dear soul you bought this from has come across good fortune. Thank you for sharing with us this week at Celebrate Your Story, and I hope your week is going great. Oh eem geeee, this is so gorgeous Jen. It really makes my heart happy to see someone who recognizes beautiful wood and takes the time and effort to restore it. Did you seal this beauty with anything? Your hard work and faith paid off. That is one stunning piece. Enjoy! Thank you so much! I appreciate you stopping by and taking the time to comment! Thank you so much Christina! I’m honored you stopped by and glad you took the time to comment! Michelle – your gushing makes me blush! Thank you! I haven’t sealed it with anything…yet. Everything I tried changed the color, so I am keeping a watchful eye until it needs it. So far so good. Sandra – I think of him often and hope that my small contribution helped him. We did get other items just to help him some more. Thank you for your kind words and for thinking of him. Oh I’m so glad I inspired you! If you go for it, please send me a pic of your coffee table. I’d love to see it! Chloe – you are so sweet! Thank you so much for taking the time to comment! Thank you so much Florence! 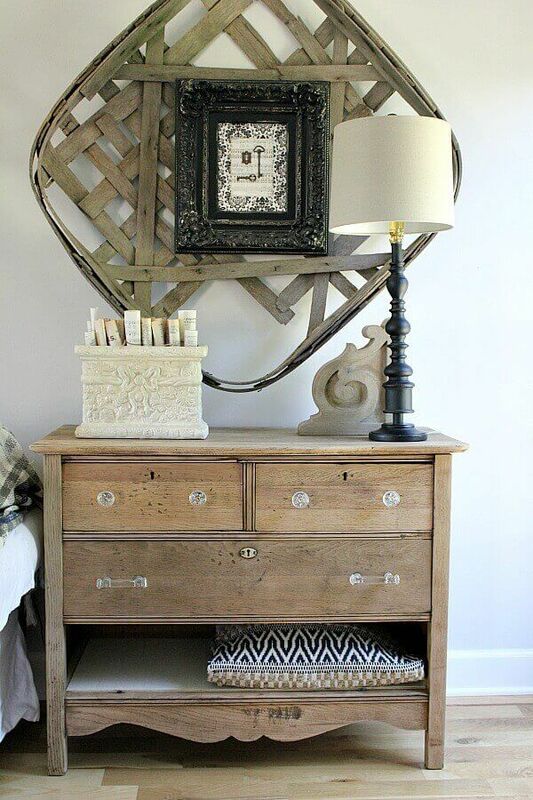 I have an affinity for tobacco baskets and am glad you like how I styled it with my dresser. I’m honored you stopped by and so glad you took the time to comment! Kate! Your comment made me giggle! Thank you so much for taking the time to comment! Love it! I have one very similar, I believe it belonged to my great-grandparents. My mom had it, my sisters and I abused it. Finally my husband and I redid it. Took it down to the wood, but we put stain back on it. Love it! 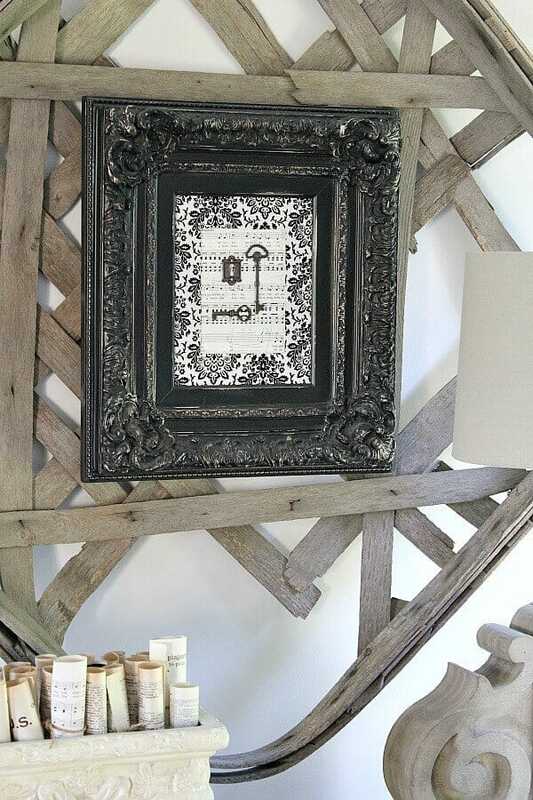 What a treasure to have that piece in your home! And I’m so glad to hear that you loved it back to life! That is a great story – thank you so much for stopping by and for taking the time to comment! The dresser is beautiful! I would try black handles to complete the look. Ooh – that’s a great suggestion! Thank you!